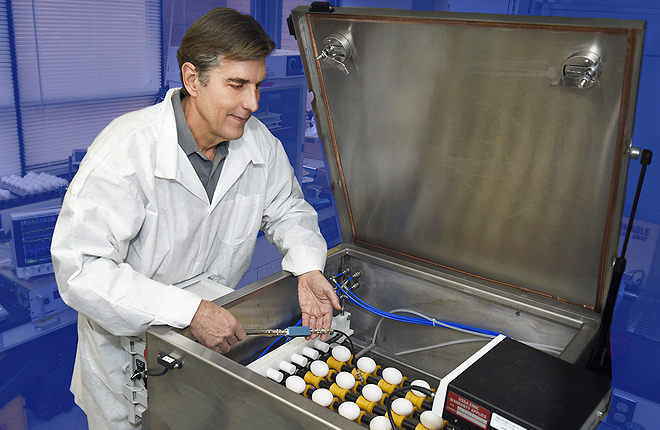 An Agricultural Research Service (ARS) scientist in Pennsylvania and his colleagues have developed a technology that rapidly pasteurizes eggs and could sharply reduce the number of illnesses caused each year by egg-borne Salmonella bacteria. Salmonella is associated with eating undercooked eggs or the raw eggs used in Caesar salad, eggnog, and Béarnaise and hollandaise sauces. Salmonellosis, as the infection is known, can cause diarrhea, stomach cramps, and fever, and can sometimes be fatal. Infants, preschoolers, pregnant women, and the elderly are more susceptible, and pasteurized eggs are often marketed to nursing homes and other institutional kitchens. But less than 3 percent of the 74 billion fresh eggs produced in the United States each year are pasteurized. Eggs are currently pasteurized by immersing them in hot water (130 to 140 °F), but the process takes about an hour and adds about $1.50 to the retail price of a dozen eggs. It can also cause proteins in the heat-sensitive egg whites to denature and coagulate. That happens because the heat has to go through the egg white, or albumen, before it reaches the more heat-tolerant, nutrient-rich yolk, where Salmonella bacteria like to grow. The patented RF process ensures that the yolk gets more heat than the albumen. The process is also faster and should lower the cost of pasteurization – and the price of pasteurized eggs on store shelves. RF technology is already used to reduce pathogens in almonds, spices, wheat flour, and other food products. Geveke and his colleagues connected electrodes to eggs, immersed them in warm water, and heated them with RF for 3.5 minutes, rotating them every minute or so to prevent hot spots from forming inside the eggs. They then placed the eggs in a hot bath to give the yolks some additional time to finish pasteurizing. The results, published in the Journal of Food Engineering in 2016, showed the RF treatment reduced pathogen levels by 99.999 percent, which is comparable to eggs pasteurized in hot water. The entire process took about 23 minutes, making it almost three times faster than using hot water, and because the process was so rapid, the egg whites were not degraded. The U.S. Department of Agriculture estimates that pasteurizing all U.S.-produced shell eggs could reduce the number of egg-borne Salmonella illnesses by up to 85 percent, or more than 110,000 cases a year. “If pasteurized eggs become less expensive and more abundant, more people are likely to choose them—and fewer people will get sick,” Geveke says. Geveke is working with a commercial partner on plans to market the technology to egg processors.—Dennis O'Brien, ARS Office of Communications. Pasteurization is used to kill bacteria in some foods. 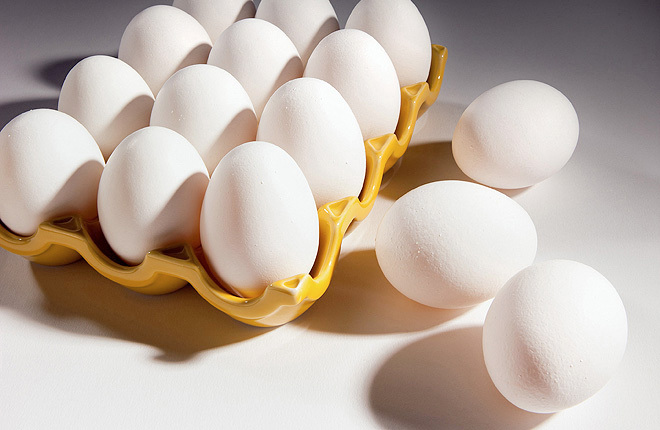 Less than 3 percent of U.S. shell eggs are pasteurized. Pasteurizing more eggs could prevent Salmonella illnesses. ARS scientists devised a faster, cheaper way to pasteurize eggs.